fairly common name and not related to our branch of the family. The above yarn concerning Captain Harris and Lady Betsy Neot probably made a good story to tell the children and grand children in later years. We now can tell the true story which interestingly begins in the Wiltshire town of Malmesbury. Betsy Neot was actually Elizabeth (Betsy) Neate who was born around 1795 in Malmesbury and was one of eight children born to John and Susanna Neate. The Neate family can be traced back to mid 1600's and originate from Calne in Wiltshire. After William and Betsy's marriage in 1817 the couple moved where work dictated. With Malmesbury being primarily an agricultural town and William being a skilled mason work took him back to Bath but they soon moved to London and settled close to the City in Southwark. This was a trend of the times with many people leaving the countyside for the developing industrial towns. William and Betsy raised seven children over the next 20 years. Their various addresses can be identified from the baptisms of their children. Remember that the first birth certificates were not issued until 1837. Their first child James Banfield Moore Harris was born December 1820 in Bath but he was baptised in Southwark in 1821. 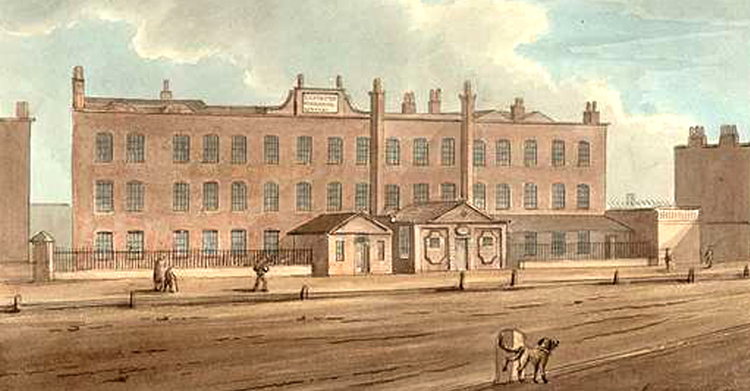 The family were living at Youngs Buildings Southwark. Thier next child Clarissa Elizabeth Harris was Baptised in 1823 and the family were living at Castle Yard King Street Southwark. There is now a five year gap until the next child William Harris was born in 1828 but we can find no record of his baptism in the Southwark area. It is probable that other children were born in this period but died in infancy. William and Betsy's next child Walter Harris was born in 1829 but again no Baptism can be found. This is also true of thier next two children. Charlotte Matilda Harris was born in 1830 and Charles Harris in 1836. Westminster with four of their children. Their next child Harriet Eliza Harris was baptised at St John the Evangelist Lambeth in June 1838. Harris was born in 1841. He was also baptised at St John the Evangelist but died the same year. & Jane Harris, then Charles & Charlotte Ward, followed by William & Betsy Harris. Elizabeth Harris died 23rd August 1871 at 38 South Street Lambeth. Her daughter Matilda Ward was present at her death.William Harris's health deteriorated after 1872 when he became a regular patient at the Workhouse Infirmary in Princes Road Lambeth. Surviving records of the Infirnery show William then aged 82 was admitted 5th February 1872 and discharged 18th May. He was readmitted 7th October 1874 and discharged 25th May 1875.He is again admitted shortly after on 3rd June and discharged to the workhouse on 26th July. This would suggest that William Harris was no longer living at 38 South Street and was permanently living at the Princes Road Workhouse. 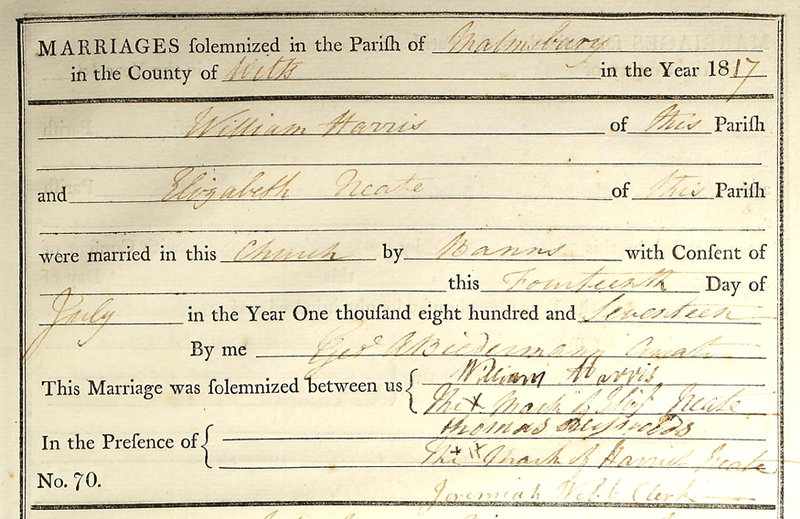 William Harris was transferred from the Workhouse to the Infirmary 6th October 1875 and discharged 11th January1876. On 25th March 1876 85 year old William was transferred again to the Infirmary and returned 27th April. 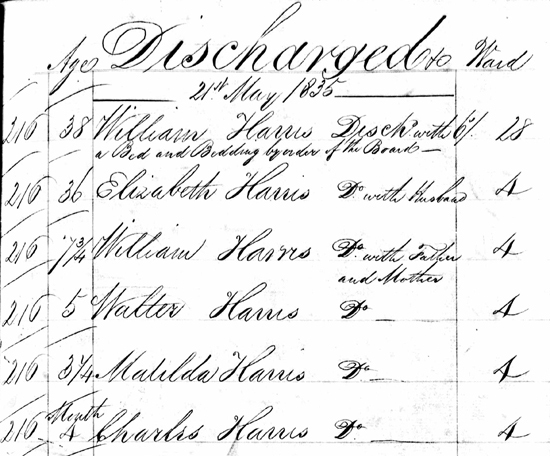 However on the 13th May 1876 William Harris transferred from the Workhouse to the Infirmary for the last time. He died there on the 18th May 1876.